At Vorys, we are continually educating ourselves regarding economic development incentives, including tax credit changes and opportunities. 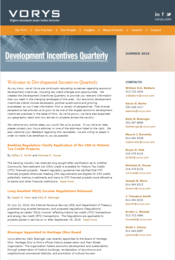 We created Development Incentives Quarterly to update subscribers on this changing landscape. Our economic development incentives clients include developers, political subdivisions and growing businesses from across the country, so the newsletter includes information from a variety of perspectives. 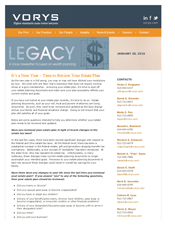 Legacy is a Vorys electronic newsletter focused on wealth planning. The purpose of the publication is to make you aware of topics and issues we feel could impact you and your family’s wealth planning and the important decision you choose to make. We are confident that you will find the content important and informative. At Vorys, we are constantly educating ourselves on the changing real property tax environment. It's our job to stay on top of these changes so you don't have to. 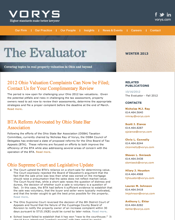 We created The Evaluator to provide the relevant information that you need in this area, including summaries of statutory and regulatory adjustments. In this quarterly publication, our attorneys will research and write articles that are insightful, interesting and helpful to you. If something is on the horizon that you should know, we'll tell you how it affects you and what you should do to prepare. In this quarterly magazine, we focus on the legal and business issues that we feel members of the financial services industry need to know. We will navigate the turbulent waters post Dodd-Frank. Developments continue to trickle in – each one coming with a new set of requirements and demands. And the Consumer Financial Protection Bureau promises new challenges for our industry to contend with. It’s our job to stay ahead of such changes, know them and understand them better than anyone. Our mission is to research and write articles that are insightful, interesting and helpful to you. 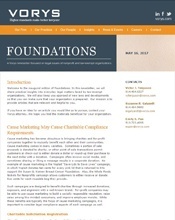 In this newsletter, we will share practical insights into everyday legal matters faced by tax-exempt organizations. We will also keep you apprised of new laws and developments so that you can make sure that your organization is prepared. Our mission is to provide articles that are relevant and helpful to you. Legacy Platinum is a Vorys electronic newsletter that covers estate and wealth planning topics that are specifically applicable to high net worth individuals. The laws and regulations that govern estate taxes have changed considerably, and some of those changes can have a significant impact on your estate.